I’m not a very nice person. I keep telling people this, and I keep being surprised by how often people don’t believe me, but it’s the truth. I don’t even think that I pretend all that well, though I do try. It’s just that being nice is not something that comes naturally to me. I’m not saying that I don’t want to be nice, or that I don’t do nice things. I’m saying that my nice things are often more calculated than I would like to admit. When I started writing about making a better world by being a better person, I meant every word of it, but I also meant it when I said that you have to start on yourself if you want to get anything done. 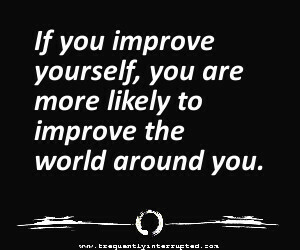 If you improve yourself, you are more likely to improve the world around you. It has to be real improvement, though, not some glossy, technicolor version you might buy over the counter or find in a How To Improve Your Productivity “self help” book. It has to come from somewhere deep inside or it’s not likely to do much improving. This presents a problem for some of us. There is no shortage of stuff deep inside of me, but most of it isn’t all that positive. Some of it is downright nasty. My first instinct is often a sneer, and sarcasm is my native tongue. If words were truly classified as weapons, I’d have a rap sheet longer than most hardened criminals. As I said, I’m not a very nice person. In truth, I’m being rather generous in my descriptions here because this is incredibly difficult to write. It’s easier to make light of it, to wrap it up in witty wording, and maybe hope that you won’t take it all that seriously, but it is serious. I am being serious, or as serious as I know how to be (not very good at that, either, to be honest). It’s not that I don’t want to look at these issues. It’s possible that I look at them too much. I saw a quote recently that said, “I’m well-acquainted with my flaws. You cannot shock me by pointing them out.” Yep, it would be very unusual for someone else to know my flaws more than I do. I know them; I just don’t express them (which, when you think about it, is actually one of those flaws). That’s the hard part. If you know the things that I see wrong with me, you will think less of me. Right or wrong, that is the natural thought process, and it is nearly impossible to be immune. Most of the time, the ones who swear up and down that they don’t care what anyone else thinks are the ones who secretly care the most. The attitude is the armor they wear to keep from being hurt by what hurts them the most. When I was in school, I was the kid who got his books knocked on the floor. Some guy ran across the playground to punch me in the face for reasons I never did learn. Some girl came up behind me in the hallway, grabbed my hips, and made them swing back and forth in an exaggerated fashion, to make fun of how I walked. I got notes left in lockers. I got nasty nicknames. I got people talking about me in front of me, forget about behind my back. I was roundly mocked at church socials. For most of those years, I didn’t know what to do about any of it, who I could talk to, or even what I might say if I even got that far. I did not grow up seeing much of the goodness in people. I’d love to say it got better, but it didn’t. I got better at coping with it, but there are bullies in nearly every social group at nearly every age. Some of the individuals get better, and, if you’re lucky, you gain more control over your environment, so gain more ability to just not be around those people, but it doesn’t really get better. There is so much pain in the world, and so many people respond to that pain in the worst ways possible. It’s frustrating, to say the least. These people didn’t teach me the value of being nice, but they gave me a focus, a hook to hang my hat on. From a certain perspective, you could almost thank them for saving my life, if you could ignore the fact that they were the ones who nearly killed me in the first place. When I didn’t know any other way to keep going, when my mind cracked so deeply that I lost most of a day and got more than a little fuzzy on the surrounding months, when I was standing on the edge with one foot already flung out over the abyss, it was anger that drove me forward. It was a furious, arrogant, stubborn denial that those people would win that saved my life. It was the realization that I had something better to offer, and I would be damned if I let those horrible people snuff it out. I was going to live to spite them, and to prove them wrong. I was going to be better than them by being better than them. Not the most noble of places from which to begin a journey of self improvement. I would like to think that I have moved forward from that starting point, and in some ways I have, but in so many other ways I haven’t. Not really. I have found more individuals who are good people, and I am so very grateful for that. They make it easier to learn how to be nice. I’m still pretty convinced that they’re the minority, though. I still have a visceral, almost explosive reaction to bullies of any sort. I don’t think that’s ever going to change, though I do try to channel it in less destructive directions these days. I’m trying to learn how to not engage with things that make me angry unless I need to, unless doing so can realistically achieve something positive. That’s not easy. That’s really hard, actually. I’ve been putting in tons of hours on the day job for several weeks now. It’s been hectic, like pull your hair out (if I had any) hectic often. I have no idea what time I’m going to leave the office most days and, if I tell Heather I expect to leave “on time,” she laughs at me. She has reason to laugh since I couldn’t tell you the last time I was right with that expectation. With all of that going on, I was asked three times in one week (by three different people, about three different situations), “How do you stay so calm?” It was my turn to laugh. I am better at real calm today than I have ever been in my life, but my secret is that I have been so far out over the edge for so long that I am the Heavyweight Champion of the World at appearing to be calm when everything inside is trying to fly apart in a billion different directions. Heather knows this, and doesn’t buy my act for a second when I start doing that. There are a few other people I know who probably have that insight, but you’d be amazed at some of the people I have fooled. There was a time when it was usually fear. Now it’s usually anger. They’re not really all that dissimilar, and neither are anything a sensible person wants to advertise. We all know that I’m a comic book geek, and it’s no secret that Superman is my ideal, what I think of when I am trying to define Good, but I have way too much self-honesty to not realize that it’s an entirely different character with whom I have more in common. I may not grow giant and green (though there were many times when I fervently wished that I could), but, if I have a spirit animals in comics, it’s The Hulk. I understand that anger waiting to break free all too well. When I watched The Avengers, and we got that scene where Banner turns back and says, “That’s my secret, Captain. I’m always angry,” that was an epiphany moment. That was, someone gets it. Someone understands. I discovered a piece of fan art the other day that depicts The Hulk sitting in meditation. There was a thought bubble that said, “Hulk no smash. Hulk no smash. Hulk … maybe smash a little.” I haven’t laughed so hard in ages. That’s right, Hulk. We can do this. Maybe we’ll smash a little, but we can do this. If we can, so can you. Something to think about.